20 g protein. 2 g sugar. 190 calories. Gluten free. 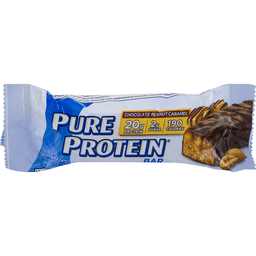 For questions or reorders call: 1-800-854-5019 or visit our website at www.pureprotein.com. Product of Canada. 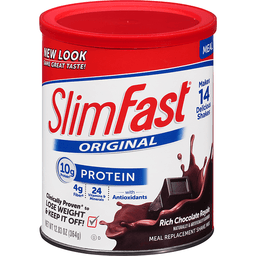 Slimfast® Original Meal Replacement Shake Mix Rich Chocolate Royale. New look. Same great taste! Makes 14 delicious shakes. 10g protein†. 4g fiber‡. 24 Vitamins & minerals. With antioxidants. Clinically proven* to lose weight & keep it off! Naturally & artificially flavored. Excellent source of protein†. Helps maintain healthy blood sugar levels. Good source of fiber‡. †As prepared with fortified fat free milk. The Slimfast® Plan™. Two delicious Slimfast® meal replacement shakes or bars. Three tasty Slimfast® 100 calorie snacks, fruit or veggies. One healthy 500 - 600 calorie meal. *When used as part of The Slimfast® Plan™. †Per shake as prepared with fat free milk. ‡Contains 4g total fat per serving as prepared with fortified fat free milk. Partially produced with genetic engineering. This package is sold by weight, not volume. Some settling of contents may have occurred during shipping and handling. This package will make the servings as indicated when measured exactly by weight (26g per serving). Sweetened with nutritive and non-nutritive sweetener. 1-800-SLIMFAST. slimfast.com.